Spin the Rainbow Wheel of Fortune! I sure hope you had a nice weekend! I spent much of my weekend working on my Doll Quilt Swap project for my partner, and it's now officially finished. I am absolutely in love with the way it's come together, and I know I'm going to have a hard time sending it off, but at the same time, I'm really excited to send it to my partner. I sure hope that she'll like it! 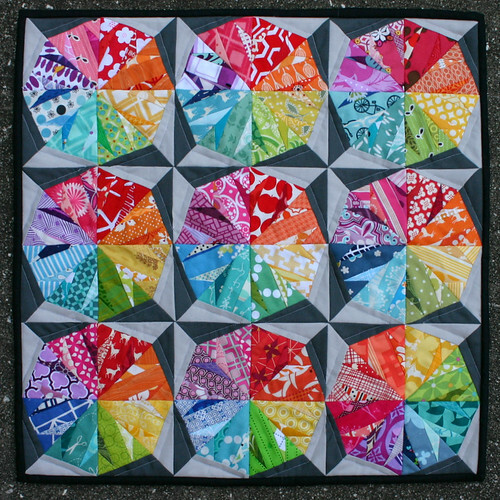 This miniquilt is made up of nine foundation paper pieced 6" blocks, each block using nine different main colors, in three different fabrics. By my count, there's over 218 different fabrics in this 18" mini. I pulled from my scrap bins for all of the prints, and used Kona Ash and Kona Charcoal for the two grays. 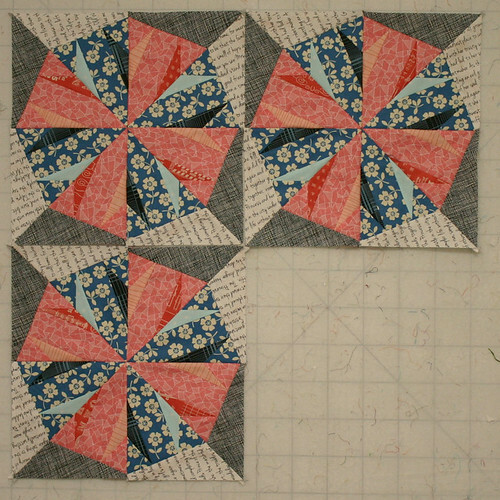 One of my favorite parts about this miniquilt is the way the grays come together to form a star when the blocks are pulled together. I had a really hard time figuring out how to quilt this, but ultimately, I went with a simple outline around the wheels, which emphasizes those stars really well. I bound this mini in Art Gallery Pure Elements in Caviar, which has a gorgeous sheen in person. It does a beautiful job framing the mini. I love working with those Art Gallery solids, they are just so soft and smooth. I make a little label for the back, using a piece of fabric, some freezer paper, and my printer, and pieced it into the backing, but I somehow managed to foul up the year on the label. Darned 2012. The swap did start in 2013, so I suppose it's not entirely inaccurate, but still. I didn't realize it until Terri pointed it out on IG after I had started the binding, so I didn't change it. I hope my partner won't hate me for that! fabrics: So many it's nearly impossible to list them all! I'm working on a pattern for this quilt, and much like in my Lucky Stars BOM, there will be two block sizes shared in the pattern, a 6" and a 12." I started on the 12" blocks at the Tampa Modern Quilt Guild meeting over the weekend, using one of the stacks of fabric I pulled last week for my Juki cover. Stay tuned for a pattern release some time next week! I love giving handmade gifts. Sometimes, I drive myself crazy trying to make too many of them, and this year was no exception. I had several handmade gifts planned and in the works, when lo and behold, when we went to visit Santa, my four year old munchkin asked Santa to help Mommy make him a new superhero quilt. I couldn't resist - I'd had the fabric for his quilt, not to mention the design and the math, for months, but had constantly pushed it aside to meet deadline after deadline. So, I decided then and there, I was going to give him a quilt for Christmas, somehow, some way. 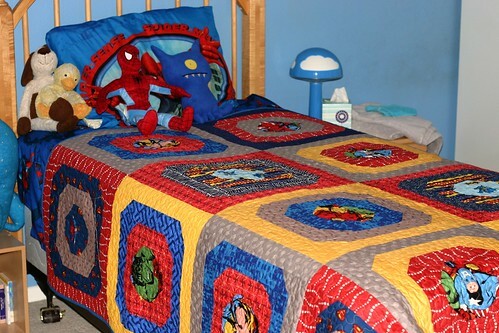 The fabrics in this quilt are an eclectic mix in traditional superhero shades of royal blue, red, gold, and gray. The center of each block is a fussy cut superhero of some kind, and the surrounding fabrics are various prints from my stash that worked nicely. These blocks are super jumbo sized, finishing at 18", thanks to the super jumbo sized faces most of the superheroes. The quilt is backed in flannel, and bound in Michael Miller's Cotton Couture, which makes it deliciously soft to snuggle with, and perfect for the chilly nights we've been having as of late. I may write a simple pattern for this quilt at some point in the new year- it's a great way to show off large scale prints, without cutting them down tremendously. So far, the munchkin is absolutely loving the quilt, and even in spite of all the amazing Lego kits Santa brought, he took several moments to admire and try out his new quilt Christmas morning, which put a huge smile on my face. While there is still a day and a half left in 2012, I feel pretty sure that this was my last quilt finish of 2012! Stay tuned tomorrow for a year-end wrap-up that may or may not feature a giveaway for all of you wonderful followers of my blog as a humongous thank you for making my day with all of your comments! Have you heard about the 100 Quilts for Kids program, co-hosted by Katie Blakesley of Swim, Bike, Quilt and the DC Modern Quilt Guild? This charity drive has a super simple premise: Make a quilt or two and donate it to a child in need. I'm working on a twist to my Sliced Coins quilt-along this year to donate, using some Urban Chiks' Hullabaloo charms that I've had sitting on my shelf for a while. It's so relaxing to do some simple patchwork for once! I was pleasantly surprised that I could manage to put together a cute little quilt top using just a charm pack and a little over a yard of sashing. Last year, I made what is quite possibly my favorite charity quilt to date, for a young woman's 18th birthday, my Drunk Love quilt, featuring some of my favorite pink and green fabrics. This was a hard quilt to say goodbye to, because I loved working on it so much, but it put a smile on my face to know that I was making something for someone who truly needed it. I donated this quilt through Margaret's Hope Chest's Wrapped in Love program, which benefits children with an incarcerated parent. If you are interested in making a quilt for this program, simply email Carin for more information. This quilt is still one of my favorite quilts that I've ever made, and maybe one day I'll make another like it. Need some inspiration or a pattern to work from? 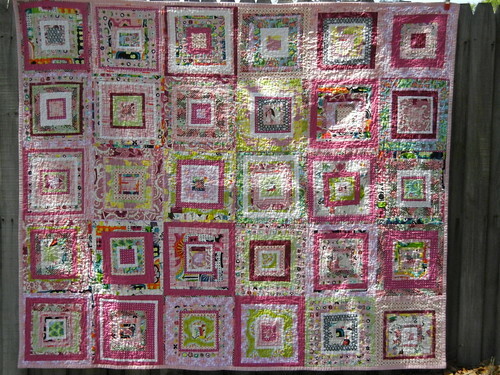 Join the 100 Quilts for Kids Quilt Along at Swim, Bike, Quilt! Link up your finished quilt here for a chance to win great prizes from sponsors, including Moda, Fat Quarter Shop, Westwood Acres, Rowan , Free Spirit, and Ty Pennington Impressions, and others. September 10: Elizabeth @ Oh, Frannson! Just a year ago today, I started my very first quilt, thanks to a budding fabric addiction. It's a really shoddy quilt, looking back on it, but it was definitely the start of something big for me. Previous to this quilt, I had sewn a few receiving blankets and some burp cloths. I had always thought quilting was pretty awesome, thanks to my amazing aunt who has quilted for most of her life, but had never thought I could do it myself. My mother attempted to teach me to sew as a kid, but it didn't really stick. I cross-stitched for a while, but eventually gave up after getting frustrated by the tedious patterns. I bought a sewing machine at the beginning of 2010 on a whim, and slowly began gathering fabrics. What for? I didn't really know right away. I started reading everything I could about sewing, and started some small sewing projects here and there, like some simple flannel blankets, burp cloths, and even a simple sling bag. I picked up Amy Karol's Bend-the-Rules Sewing book at the library and I found a super simple strip quilt pattern, and I felt compelled to try it. I had no idea what I was doing, barely knew how to measure and cut fabric, it's amazing the quilt was even a rectangle. I used store-bought binding, which I haven't done since, and totally fudged my way through mitering the corners. So, like I said, it's a little shoddy, but it's my first quilt, and it made me a quilter. This little quilt stoked a fire in me that has kept me quilting for the last year. A flimsy finish...but a festive one all the same! This is the first quilt where I really feel like shouting "Ta da!" I'm so proud of this quilt, my Charming Bento Box quilt, despite how simple it may seem. I feel like this quilt is so "me." 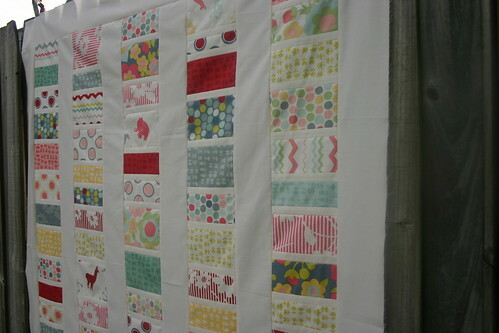 I think what makes me the most excited about this quilt is the fact that it really doesn't come from a pattern. This was the first time that I really made up a quilt as a I went. I was certainly inspired by Film in the Fridge - Ashley's work is just so breathtaking and creative! I'm still debating how to back this quilt, whether I go with a solid or find a coordinating print from this fabric collection, Kate Spain's 12 Days of Christmas, but I've got time to figure it out. Since this quilt is staying at my house, I've got plenty of time to finish it up before the holidays! I am working on writing a tutorial on how to make these blocks, especially since all it takes is a charm pack. I love charm packs. They're a great, inexpensive way to find yourself with a wide variety of complementary fabrics. And they look so cute, to boot! 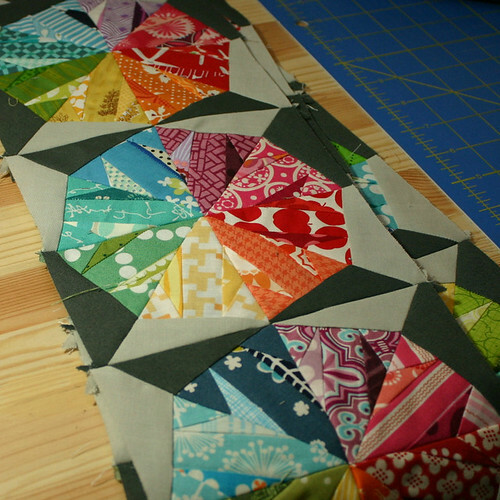 I'm sharing this almost-finish over at Fabric Tuesday this week. Have you visited Fabric Tuesday yet? 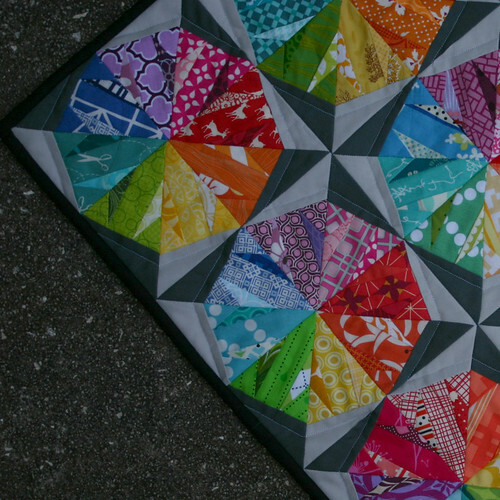 It's a lot of fun, and a great way to find more inspiration, so make sure to stop by QuiltStory. Happy sewing! I'm going to finally finish up the Castle Peeps doll quilt! Tune in Monday to see what's brewing next and to see how to doll quilt turns out! Rockets and Robots, Oh My! Once upon a time...there was a little boy who was unusually tall for his age. And his parents talked in passing about moving him into a twin bed, with him quickly outgrowing his toddler bed, and suddenly, lists were being made. Shopping trips planned. My husband and I are pretty project oriented, so when we decided to move our son Ryan into a big boy bed, it was full steam ahead for both of us. Ryan's really big on rockets and astronauts, so I thought outer space would make a great theme for the new room. And then, I remembered the box of clearance fabric in my closet. Oh, Fabric.com, your blowout sales are so killer sometimes! I snapped up the whole Robots collection by David Walker for $3/yd earlier this year, not really knowing what I would do with it, just that it was adorable, and I that it would make my munchkin smile. I knew it was the perfect place to start for a twin-sized quilt to go with this new big boy bed. At first, I wanted to make another mixtape quilt, but then, I decided for the sake of continuity for my son, I would use the same pattern I used for his baby quilt, the Zoology quilt. I adapted Elizabeth Hartman's Simple Modern Baby Quilt pattern to fit a twin size bed, causing a big headache for me, thanks to all the math, but leading to a really adorable quilt finish. I threw in several other fabrics, after visiting some local quilt stores, including some Moda marble dots and some Heather Bailey. I worked on the quilt slowly, while also working on all of the other facets of the room - painting, adding wallpaper decals, shopping for the furniture, and so forth. Every time Ryan would see me working with the fabrics, he'd ask what I was doing, and I would say I was working on his special treat. He was quite patient for a toddler! When we finally declared the room complete, he was more than excited. He was positively ecstatic. 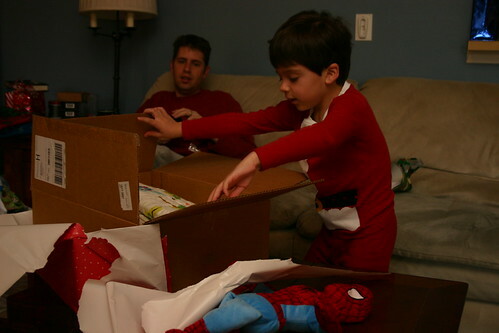 He ran around, looking from piece to piece in his room, from the artwork on the walls that his father and I painted to the wallpaper die cuts to the quilt and so on. The room has become his little sanctuary and he just loves it. I love that my living room is no longer decorated in the primary colors of his toys! He even snuggles on the couch to watch TV with the quilt sometimes. So sweet! Even now, six weeks after he's been in the "big boy room," he still shows it off to everyone who visits, and tells everyone about his "special treat" quilt. 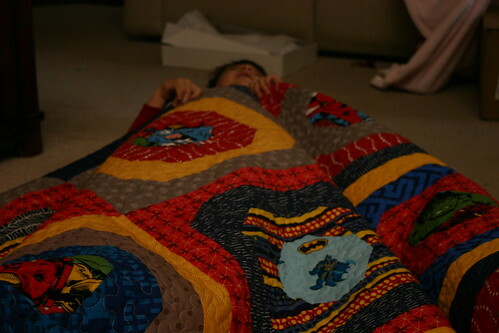 I love how much he loves this quilt, it just makes me smile to see him with it. It's the first quilt I've ever hand-sewn the binding on with, as I normally machine everything since I am completely unskilled in hand sewing. It was tedious, hard work, but it sure does look awesome. My sewing desk is, once again, a mess, but this time in a good way. I did a lot of prep work on several projects today and I'm hoping to finish several of them in the next few days. I worked on my first pair of shorts, for my munchkin's Halloween costume. It's shocking how difficult it is to find a simple pair of black knit shorts for a toddler. Hence, the sewing of them. I've never really sewn any garments to speak of, other than my first skirt recently. I think garment sewing is a whole different ballgame than quilting, one I don't know all the rules to yet, so I feel a little hesitant on wrapping this project up. I want to re-read the pattern one more time before I make the elastic casing and sew the hems on the shorts, just to make sure I'm doing it at least 80% right. Haven't tried these on the munchkin yet, but boy, they sure seem big! After wrapping up my Boss's Day gifts yesterday, I felt compelled to make more mug rugs, this time to grace my own house. No one warned me that these things are addictive. I'm starting to wonder if I'm going to find myself making sippy cup rugs for my son's Christmas stocking or something equally strange. These are cute, though, and used real scraps, so I can't wait to see how they turn out after I finish them up. I just adore this colorway of Amy Butler's Lotus line! Real leftovers from the Boss's Day mug rugs - must be a record for the quickest turnaround for scraps! The doll quilt for my niece has been glaring at me the last few days. I've neglected it, I know. It's been ready to baste and quilt for weeks and I've put it off and off and off again, so today, I busted out my basting pins and basted that little bad boy together once and for all. Then, I proceeded to waffle for a full twenty-one minutes as to how I wanted to quilt it. Yes, twenty-one minutes. I think I'm going to go with an all-over stipple, but I'm not 100%. Feel free to try to sway me another way in the comments! 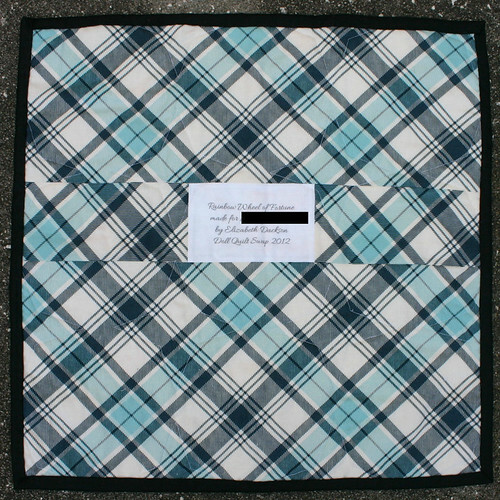 The first quilt I made was for my son, Ryan. He was moving into a toddler bed, and I wanted to make a quilt for him. He was never much for blankets, and rarely slept with much more than a receiving blanket, but this quilt changed things. He became obsessed with covers after this quilt appeared on his bed, so much so that one of his favorite games to play is the under-the-covers game, where he climbs into my bed and pretends to sleep, after tucking himself in under my covers. This quilt was inspired by a fabric that I saw at one of my favorite online fabric stores, Fabricworm - Michael Miller's Zoology. Ryan has always loved animals, and when I saw this print, I knew he would love it just as much as I did. 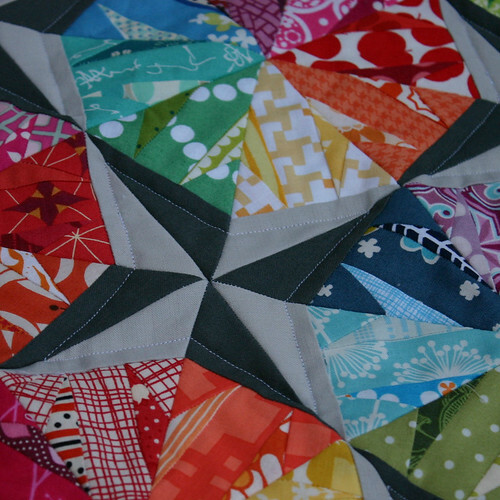 This quilt is fully machined - machine-pieced, machine-quilted, and even machine bound. It wasn't until the last quilt I did, my 7th, that I actually attempted hand sewing on the binding. I'm kind of allergic to hand sewing. Love, love, love my sewing machine, though. It was with this quilt that I really learned my sewing machine inside and out. It was this quilt that made me realize how much I enjoyed sewing, and quilting especially. I think I did three or four practice quilt sandwiches before I actually started the free motion quilting. There were at least three or four seriously bad oops moments while I was quilting, but when you look at the quilt as a whole, you'll never find them. Me, on the other hand? For a long time, they were all I could see. Now, I can't even remember where they were. And Ryan? 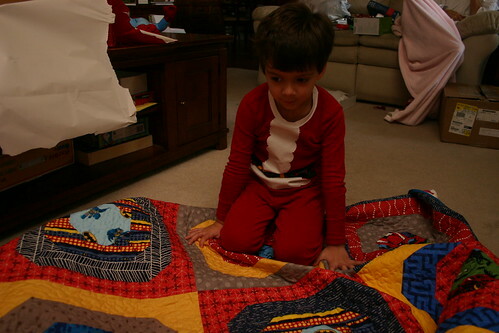 His favorite part of the quilt was the corner where the mitering is far from perfect. He liked the feel of that corner, probably because of its wonkiness. Today, the quilt is folded up in my closet, as Ryan now sleeps in his new, big boy room, complete with a twin sized bed, and of course a twin sized quilt to go along with it. I still smile when I see it in my closet, it's one of those things that will brighten my day when I see a little bit of that fabric. I love reading quilt stories, so tell me yours. What was your first quilt? Who was it for? Is it still loved today? Note: The pattern I used for this quilt can be found here.